Can the American Elections be Saved? Although Americans have many opportunities to vote, large proportions of the citizenry (majorities in most cases) often do not exercise their right to do so (figure 1.9 summarizes typical levels of participation for various types of elections in the United States). These low levels of voting represent the most visible symptom that something is wrong with U.S. elections. And if we expect elections to be the principal means for the governed to control their governments, such low levels of voter participation are harmful to democracy. The bulk of the evidence of political science research shows that low voter turnout is relevant: when fewer people vote, the voting public ceases to reflect the needs and desires of the public as a whole (in terms of social class, age, etc. ), and the governments chosen by such voters become less representative of the majority—and consequently, less democratic. U.S. elections are suffering from an illness characterized by an absence of competitive elections, by lack of political equality, by failing supportive institutions, and by a fatigued electorate. These are the ailments that produce the symptoms, more visible than their causes, of low voter turnout, political cynicism, and a poorly informed public. If a person’s environment causes a great deal of stress, for example, or causes breathing difficulties, he or she becomes more likely to fall ill. The same is true of elections. The “disease” that is making U.S. elections ill must be considered separately from the unhealthy behaviors and the environment, factors that increase elections’ susceptibility to dysfunction and make the system less likely to recover quickly. In this chapter, I identify several leading contributors to the poor health of U.S. elections: (1) the current legal environment surrounding elections, particularly campaign-finance law, redistricting, and election administration; (2) the structure of U.S. elections; (3) the nature of the mass media in the United States; and (4) the behavior and choices of the candidates and the public. Elections in the United States depend heavily on the mass media to inform the electorate of their choices on the ballot and to act as referees of the campaign discourse. By almost any account, the media have failed to provide that support, thus contributing to the poor health of U.S. elections. The key reason is that the mass media in the United States are owned by private businesses whose main motivation is profit. That basic fact is unlikely to change, thus prescriptions for improving the health of U.S. elections through changes in the mass media must, as those suggested here do, work around that circumstance. The proposals offered here would probably help the system if they were implemented apart from any other changes, but the impact they might have on the health of elections would be greatly enhanced if they were adopted in conjunction with the reforms discussed in the following chapters. The basic structure of elections, in terms of who is elected, when, and by what means plays an important role in the way elections operate. Poorly structured elections make it difficult for citizens to use elections as a means of popular control of government and give some citizens a more important role than others. Thus any attempt at restoring U.S. elections to health must address the problems generated by the way elections are structured. Although the American political parties have become involved in the practice of some activities that are detrimental to U.S. elections, healthy elections are unimaginable without strong, competitive political parties. In order to encourage the use of political parties as a means of structuring the choice in elections around philosophies of governance, one thing that needs to change is the rhetoric of the Democratic and Republican Parties and their candidates. If the rhetoric of partisans were more substantive, if it focused on the real nature of the choice that the parties offer voters (and not on irrelevant matters designed to distract voters or divert them from voting according to their overall interests), then members of the public could better understand what their electoral choices truly mean. … Campaign finance laws need to be altered to ensure that the bulk of the money in the campaign system flows through the political parties, and some adjustments are also needed in the way that parties use money on behalf of their candidates—adjustments to make elections more broadly competitive. Electoral competition is the lifeblood of elections; without it voters’ chance to hold elected officials responsible or to effect desired changes in their government is limited. As I document in this chapter, laws that govern campaign finance and redistricting play a key role in determining the levels of competition in legislative contests. The laws as they exist today do more to diminish competition than to encourage it. So an important part of the plan to restore health to U.S. elections involves changing these laws in the manner prescribed in order to encourage greater interparty competition. The way the United States manages the act of voting could also be improved in order to ensure equal treatment of voters and to avoid crises in the legitimacy of elections when contests are close. the public must shoulder its share of the responsibility for the poor health of elections. Having people take responsibility for the state of elections and democracy, I might also point out, is the ideologically conservative solution for electoral problems. … Therefore part of nursing U.S. elections back to health requires that the American public break away from these bad habits. Democracy in the United States needs citizens (1) to see elections for what they are, namely, instruments of power for aggregations of like-minded people; (2) as a logical consequence of that more realistic view of elections, to vote based on the party, not the person; (3) to replace some of the time they spend watching television with reading about government and politics, and in the process support good journalism; (4) to become more involved their communities; and (5) to become thoughtful skeptics rather than reactionary cynics. 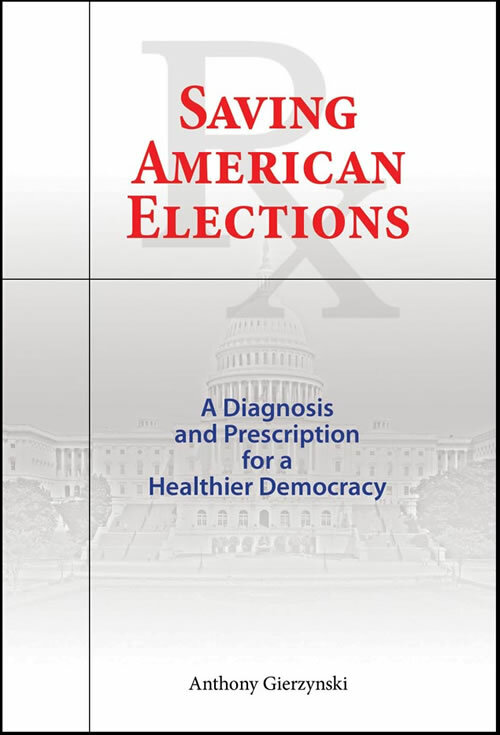 Saving American Elections: A Diagnosis and Prescription for a Healthier Democracy by Anthony Gierzynski has earned rave reviews from journals and experts. The book is a must read for the 2016 election. Saving American Elections is part of the Politics, Institutions, and Public Policy in America (PIPPA) book series (Editors: Scott Frisch and Sean Kelly). See more well-reviewed books in the Cambria Press PIPPA Series. About the author: Anthony Gierzynski is Professor of Political Science at the University of Vermont and the Director of the James M. Jeffords Center’s Vermont Legislative Research Service.